Each of the new partners joining the NetSuite Solution Provider Program cited NetSuite’s market leadership, high customer satisfaction, extensive ISV partner solutions and rapid growth as key factors behind their decisions. Luxent, focused on the manufacturing and distribution industries and with more than 700 customers worldwide, is opening its first cloud ERP practice through its NetSuite partnership, offering planning, implementation, optimization, training and integration solutions. 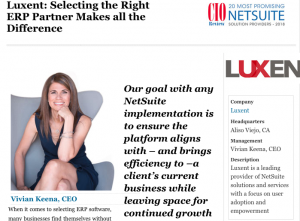 Based in Aliso Viejo, Calif., with offices in Boston, Chicago, Atlanta, Indianapolis and Mexico, Luxent will leverage NetSuite’s capabilities tailored to manufacturers and distributors in its implementations and customizations of the integrated cloud solution. Luxent is also planning to leverage the NetSuite SuiteCloud Development Platform to offer its iQ configure, price, quote application and LiNK Data Integration solutions as NetSuite SuiteApps. 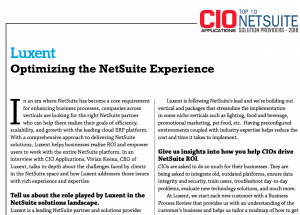 Launched in 2002 and earning a 5-Star ranking in the 2014 CRN Partner Program Guide, the NetSuite Solution Provider Program is the industry’s leading cloud channel partner program, providing hundreds of channel partners with a cloud solution to offer prospective customers and grow their businesses as well as industry-leading margins and innovative incentive programs, like the NetSuite SP100, which pays partners 100 percent of first year NetSuite sales revenues. With cloud computing at the forefront of the hottest trends and cloud ERP leading the way, channel partners representing on-premise products like Microsoft Dynamics GP continue to build new practices based on NetSuite’s superior cloud business management suite. Designed to help solution providers transform their business model to fully capitalize on the revenue growth opportunity of the NetSuite cloud, the NetSuite Solution Provider Program delivers unprecedented benefits that begin during recruitment and range from business planning, sales, marketing and professional services enablement, to training and education.